BY MARTHA SUMMA-CHADWICK & STEVE WEISER A spectacular series of concert performances, lectures, and workshops to advocate for a very special musical cause is scheduled in the beautiful city of Erie, Pennsylvania, during the week of April 13 to 17. The Erie Chamber Orchestra (ECO) has designed a distinctive week long festival to promote the idea of music for therapeutic as well as aesthetic use. To create this unique musical tapestry, the ECO has woven a network of local, regional, and national partners to help disseminate information about this very important cause. The festival had its roots in local events beginning in May 2013. Always seeking opportunities to reach out to the community and share the joy of music, the ECO connected with Erie’s Barber National Institute (www.barberinstitute.org – BNI), a nonprofit organization serving persons with a wide range of disabilities, with a special focus on children with autism. A school wide instrumental petting zoo day initiated by the ECO proved to be a landmark event for students and faculty at BNI, as well as the ECO musicians by establishing a deep bond between the two organizations. Since then, ECO musicians have provided dozens of memorable experiences for the clients and educators at BNI in the form of monthly, on-site concerts. The annual petting zoo day concludes each season in late May. How does an organization lay the groundwork to bring such an idea to reality? After discussing the idea with a network of friends and colleagues, Weiser was put in touch with Martha Summa-Chadwick, DMA, Executive Director of the nonprofit organization Music Therapy Gateway In Communications, Inc. in Tennessee. Dr. Summa-Chadwick, a concert pianist and active campaigner for the use of biomedical music techniques with persons with special needs, is a frequent guest speaker at regional and national conferences in advocating for these techniques to assist persons with motor, speech, and cognitive challenges. Unlike standard music therapy based on social sciences, biomedical music techniques result from evidence based research (developed at Colorado State University) that shows how music and rhythm can actually help redirect neural networks. 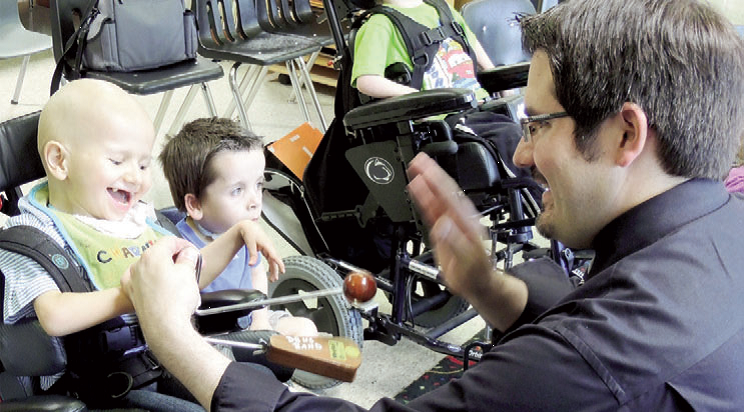 MTGIC has already established unique concert and workshop opportunities to advocate for the use of music in therapy, and the connection with the ECO was a natural for both organizations. Knowledge gained from such presentations is a worthy goal, but an essential part of a music festival is enjoying wonderful music! The ECO will sponsor two concerts during festival week. The festival activities will begin with a chamber concert on April 13 (as part of their Joe Luckey recital series) when Summa-Chadwick will join the musicians of the ECO in a chamber concert dedicated to bringing awareness to the idea of music in therapy. This concert, presented at 7:30 pm at the Unitarian Universalist Congregation of Erie, will feature the Schumann Piano Quartet in E flat Major on the first half of the program. The Quartet, written in 1842, was composed during Robert Schumann’s “year of chamber music” when his (probable) bipolar disorder still allowed him full latitude in his compositional efforts. The second half of the evening’s chamber concert will feature a performance of Claude Bolling’s lighthearted Suite for Flute and Jazz Piano. The audience will be encouraged to feel how the music makes them want to tap their toes and embrace the flow of the rhythm, which is the basis of how music is such a powerful force in the therapeutic world. Summa-Chadwick will also present a preconcert lecture at 7:00 pm for audience members interested in learning about the dynamics of music and the brain. Master classes, lectures, and workshops presented by Summa-Chadwick will follow throughout the week, as musicians and audience members will be invited to learn about the physiology of the musician’s brain as well as learn how the biomedical music techniques affect the central nervous system. Some of these presentations will be in the form of individual sessions, but many are open to the public; check the ECO website for specific information about presentation dates and times. To conclude the week’s events, the full orchestra of the ECO will participate in a symphonic tribute designed to highlight works by composers with neural challenges. Maestro Kraemer will lead the ECO in works by Beethoven, Schumann, and Wolf at First Presbyterian Church of the Covenant, 250 W. 7th St in Erie on April 17. The concert will include a pre-concert lecture presented by Summa-Chadwick, providing detailed information about the composers’ neural challenges and then commence musically with Wolf’s Scherzo and Finale, a composition written before Wolf’s chronic bouts of depression overcame his ability to compose. Following this work, the ECO will be joined by Summa-Chadwick at the piano and the Slippery Rock University Concert Choir, led by Director of Choirs Stephen Barr, for Beethoven’s Choral Fantasy, Op. 80. Written in 1808, six years after Beethoven’s despair over his impending deafness had caused him contemplate suicide, the Choral Fantasy is thought by some to be a preparatory composition to his triumphant 9th Symphony. The legacies of these incredible composers show how each was able to persevere beyond their neural challenges and leave the world a treasure trove of wonderful music. By designing this exceptional music festival in April 2015, the ECO also seeks to create a legacy of information and memories of wonderful music with the knowledge of how it affects us on many levels. Additional information about the festival week with the Erie Chamber Orchestra can be found at www.gannon.edu/eriechamberorchestra. Steve Weiser, GM of the Erie Chamber Orchestra, is now in his third season with the Erie Chamber Orchestra. A trained classical musician, Mr. Weiser was previously the Principal Timpanist of the Reading Symphony for 8 seasons and operated a full-time percussion teaching studio. Mr. Weiser additionally plays percussion with the Erie Philharmonic and the Erie Chamber Orchestra.